RALEIGH, North Carolina–The U.S. News & World Report has ranked the NC State College of Education No. 15 in the nation in its 2018 edition of the Best Online Graduate Education Programs released Jan. 9. That’s a jump of 14 spots from the previous year and the highest ranking among schools or colleges of education in North Carolina. U.S. News ranked 292 online graduate education programs on five general categories: student engagement, student services and technology, admissions selectivity, faculty credentials and training, and peer reputation. 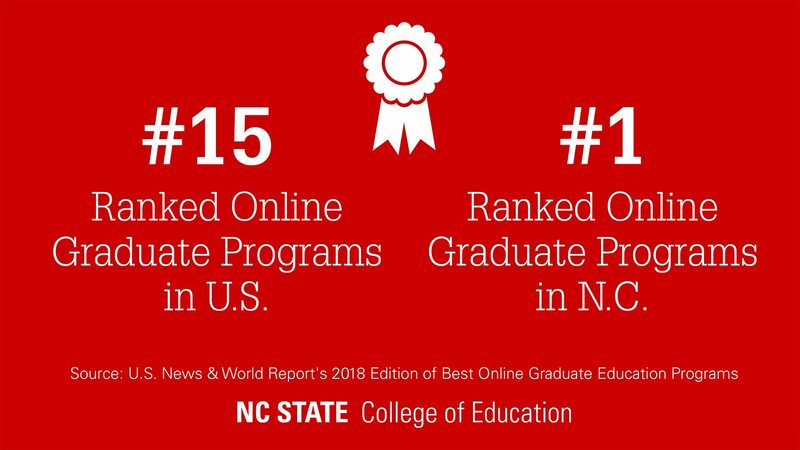 The NC State College of Education saw gains in the categories of student engagement, admissions selection selectivity, and peer reputation from 2017, when U.S. News ranked the college’s online graduate programs No. 29. Now in its 90th year, the NC State College of Education offers about 60 undergraduate and graduate degree programs, including nearly a dozen online master’s degrees and graduate certificate options. The college enrolls over 1,700 undergraduate and graduate students, and two-thirds of its faculty currently engage in 139 research projects funded through over $54 million in active research and development grants. The NC State College of Education is also the largest supplier of STEM educators, consistently ranks as the top teacher preparation program in the state across multiple variables, and has established a leadership pipeline for schools, community colleges and higher education in North Carolina. U.S. News & World Report ranks the College of Education in the Top 15 percent nationally among graduate schools of education.